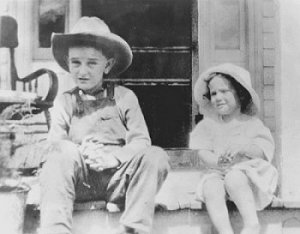 On the day Lyndon Baines Johnson was born, August 27, 1908, his grandfather Sam Johnson Sr. rode his horse through the countryside shouting, "A United States Senator was born this morning!" It seems that Lyndon Johnson was destined to have a political future. His mother, Rebekah, doted on him and spent a lot of time teaching him the alphabet and how to read and spell. He enjoyed running away from her and eventually started running away to the nearby one-room school. The teacher would hold him on her lap and let him read to the other children. They enrolled him in school at a very young age. Whatever was happening, Lyndon wanted to be the leader. He also was drawn to adult conversation, especially if they were talking about politics. His father, who was a farmer, ran for and secured a seat in the Texas legislature. After three years of crop failures, the family was ruined financially and thrust into poverty. They lost their home and the ranch and ended up in debt (which Lyndon later paid off ). The Johnson children would sometimes come home to no food in the house. Sam Johnson Jr. began to drink heavily and gave up his seat in the legislature. To support his family he worked as a game warden for $2 a day and as foreman of a highway maintenance crew. Lyndon graduated from high school at the age of fifteen and he and some friends went to California to pick grapes and do odd jobs. He then returned to Texas and worked at manual labor on a road crew. He finally decided it was time to get an education and enrolled in the South West Texas State Teachers College in San Marcos because of the low tuition rate of $45 a year. He worked his way into the good graces of the college president, Cecil Evans, and that opened a door for him to go to Austin with the president and lobby for school funds. This was the start of his political career. When his money ran out, he quit college and began teaching school. He took a great interest in the welfare of the seventh and eighth grade Mexican-American children in his class, starting a lunch program and organizing athletic teams and debate teams. Lyndon met Claudia Alta Taylor in the summer of 1934. She was from a well-to-do family, had finished college, and was a reporter for the Daily Texan. The family called her "Lady Bird" because when she was a baby her nanny had said she was "as pretty as a little lady bird". He knew she was the girl for him from the moment he met her and even proposed to her on their first date. She didn't accept right away. She was concerned he might only be interested in her because of her money, but he successfully wooed her and they were married in November after a short courtship. He had an opportunity to run for a seat in the House of Representatives in Congress. He campaigned hard and visited every city and town in his district. Two days before the election he became ill and was rushed to the hospital with a ruptured appendix. He followed the election returns from his hospital bed and won by more than 3000 votes. He was 28 years old, the youngest Congressman in Washington. He approached the job with his characteristic enthusiam. He personally answered letters from his constituents* until his hands bled. He worked for rural electrification in order for farm families to have electricity just like the city folks enjoyed. His father had once told him, "Measure each vote you cast. Is this vote in the benefit of the people? What does this do for human beings?" This became his rule. During World War 2 he joined the Navy and became a second lieutenant. On one occasion he joined the aircraft crew of the Heckling Hare, for the ride on a mission over Papua New Guinea and experienced some combat, but only as an observer on the plane. He managed to get a Silver Star ribbon awarded to him for the mission, though none of the other men on the plane received ribbons. Many times his approach was heavy-handed. It was as if the means, whatever they were, would justify the end. He applied pressure to fellow congressmen, buttonholing them, getting right in their face, and giving them "The Treatment". Sometimes he traded favors to gain the support of others and called in those favors when needed. Senator Johnson giving Senator Richard Russell "The Treatment"
Johnson aspired* to a higher office and in 1942 decided to run for a Senate seat, but this time he was unsuccessful, losing to Texas governor "Pappy" O'Daniel. In 1948 he tried again running against popular governor Coke Stevenson. In the middle of the campaign Johnson became very ill with a kidney stone attack. He wanted to withdraw from the race, but Lady Bird talked him out of it. The doctors had to operate on him. He ordered three telephones for his hospital room and continued to campaign from there until the doctors released him a week later. Johnson used a helicopter in the campaign. This was something that had never been done before. It became known as the "Johnson City Windmill". He made thirty stops a day over widely separated towns in Texas. It had a loudspeaker attached to the undercarriage of the helicopter and Johnson would announce his arrival. He would fly over fields and sometimes address the farmer on the tractor below by name and ask for his vote. The helicopter had to be refueled with a truck carrying 50-gallon drums of 90 octane gas. The truck driver had to race across the countryside to stay ahead of the helicopter. He resorted to telling lies and spreading rumors about Coke Stevenson in order to win. At election time Johnson received 87 more votes than Stevenson, out of a total of 988,295 votes cast. Johnson referred to it as his "87-vote landslide". There were accusations of "ballot box stuffing" from both sides. History records the infamous 87 votes from Box 13 in George Parr's Duval County. Dale Baum, associate professor of history at Texas A&M University summarizes it this way, "Accounts by historians of LBJ's razor-thin victory have invariably* converged* on the Thirteenth Precinct in the South Texas town of Alice in Jim Wells County, where 202 Mexican-American voters, some of who were deceased or had been absent from the county on election day, reportedly lined up in alphabetical order at the very last minute to cast their ballots overwhelmingly for Johnson." 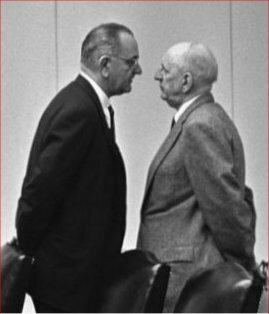 Stevenson called for a recount of the votes, but Johnson contested the recount all the way to the Federal Supreme Court where Judge Hugo Black ruled that the federal government did not have jurisdiction* to interfere with the states counting of the ballots. This was a victory for Johnson and he was declared the winner. Lady Bird Johnson helped her husband with campaigning as well as raising the couple's two daughters and purchasing and managing a radio station. Lyndon steadfastly denied having anything to do with the business, but undoubtedly his influence was a great help to her. Johnson loved to give gifts and build good will with other people of influence. Johnson had aspirations to be President of the United States from the time he was a child. When he was nine years old he told his friends he was going to one day be President of the United States. He thought his time had come in 1960, but the highly charismatic* John F. Kennedy dashed his hopes at that time. Kennedy was elected President and Johnson was his Vice-President. Johnson didn't like being Vice-President. There was not much glory and very little responsibility. All that changed on November 22, 1963 when President Kennedy was shot and killed by Lee Harvey Oswald while the President was visiting in Dallas, Texas. 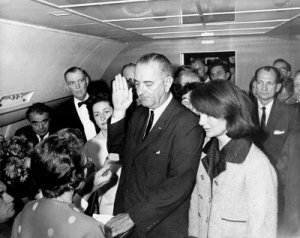 After the assassination, the oath of office for the President was administered to Lyndon B. Johnson aboard Air Force One as they were flown back to Washington D.C. When Johnson inherited the office of President, he also inherited a host of problems that came with it. The nation was engrossed in an unpopular, unwinnable war in Vietnam. There were protests over the number of American soldiers who were being sacrificed to the effort. Young men were burning their draft cards and moving to Canada to avoid serving in the military. When Johnson was later elected after serving out Kennedy's term, he promised not to widen the war, but by December 1966 there were 385,000 troops and by the time he left the presidency, there were over half a million soldiers in Vietnam. By the time the war was over, 58,000 Americans had died there. Another problem Johnson inherited was the civil unrest caused by unequal rights for citizens. Johnson became a Congressman in 1937 and for eleven years he voted against every civil rights bill, even against legislation aimed at ending lynching. Until 1957 he had consistently opposed civil rights legislation. After he was elected President in 1968 he started saying he was an advocate for equal civil rights, but his actions didn't match his words. A huge crowd of marchers gathered at the White House singing "We Shall Overcome". Their message to Johnson was "We shall manage to win even without you." Johnson saw the "handwriting on the wall". 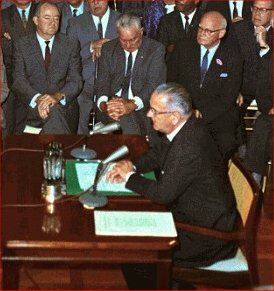 He promised there would be no delay on a strong civil rights bill and "We shall overcome" became his mantra* as well. Martin Luther King watching the broadcast on television in Selma Alabama began to cry. The bill insuring voting rights for blacks was passed with remarkable speed due to the pressure and influence of the President. In 1935 when Franklin Roosevelt signed the Social Security Act, there was no provision for medical care for the elderly. 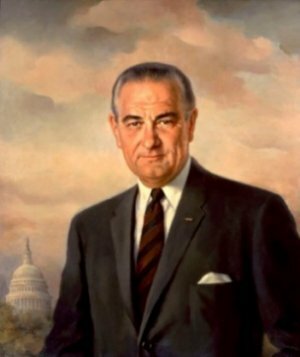 Through the efforts of Lyndon Johnson along with many others the Medicare Act was passed in 1965 providing some medical benefits for older people. Through the years the cost of medical care has escalated and many people are retiring. The funding of the program is now hard to sustain and lawmakers are trying to find a solution. Lyndon Baines Johnson helped a lot of people, but he was also self-serving. Brigadier General James Cross (earlier Major James Cross) was the personal pilot for Johnson from the time LBJ was Vice President, then as pilot of Air Force One. He tells how Johnson didn't care what flight protocols* were violated or rules were broken as long as he got to his destination on time. This biography by Patsy Stevens, a retired teacher, was written August 20,2012. Press "Go" to search for books about Lyndon Johnson. This page displayed 22,735 times.